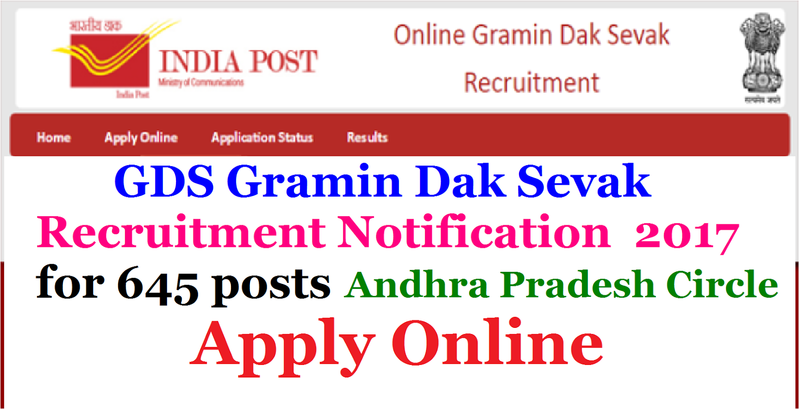 AP Post Office Recruitment 2017: Apply online fro 1126 Gramin Dak Sevak ( Post man) Jobs. Andhra Pradesh Postal Circle has released a notification recruitment for 1126 of Gramin Dak Sevak vacancies .An eligible candidates who are eagerly looking for Andhra Pradesh Notification 2017 through the official website. Candidates age limit should be in between 18 years to 40 years as on 19th April 2017.To get more information about the organisation,last date,application fee ,online application process ,selection process, pay scale,candidates have to refer the official advertisement. all the subjects as per the respective approved board norms is mandatory for taking candidate into account for calculating the merit. N. How to apply:- Candidate who desires to apply online will have to register himself in the portal through https://indiapost.gov.in or https://appost.in/gdsonline with the basic details to obtain the Registration Number.